We first covered PayPerPost when it launched three months ago. 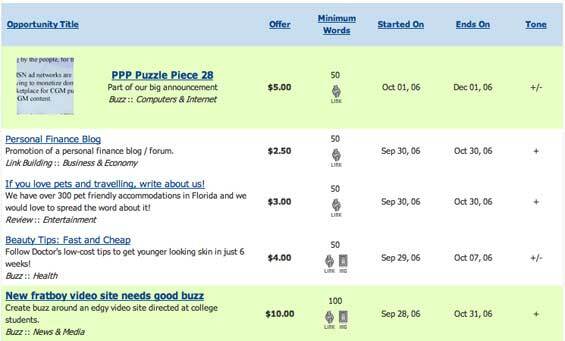 The service is a marketplace for advertisers to pay bloggers to write about products for a fee. Commenters to our original post were polarized into those violently for and those againt the product. The key area of controversy is the fact that advertisers can mandate that posts be positive on the product, and disclosure of payment is optional for the blogger (screen shot at end of post shows sample available writing opportunities). The controversy didn’t stop venture capitalists from quickly jumping on board, though. On Tuesday PayPerPost will announce a $3 million round of financing led by Inflexion Partners and with participation from Villiage Ventures and Draper Fisher Jurvetson. Dan Rua from Inflexion and Michael Barach from Villiage Ventures will take board seats. Josh Stein from Draper Fisher Jurvetson will become a board observer. Rob Hof from BusinessWeek and I spoke to founder Ted Murphy and DFJ’s Josh Stein earlier today about the financing and the product in general. The conversation is available as a podcast at TalkCrunch. Rob’s post on the news tonight is here. Ted says his business is doing quite well in spite of (or possibly due to) all of the controversy raised by paying off bloggers to write about certain products. And Josh Stein at DFJ seems excited about the potential profitability of the company while downplaying the ethical issues raised by this and other blogs – the market will sort things out, he says. Some back of the envelope calculations based on numbers Ted disclosed in the podcast suggest that revenues after the first few months of operations have topped $100,000. Podcast Interview with founder Ted Murphy and VC Josh Stein is here.